Early in 1936, Leon Bibel did a remarkable series of brush, pen and ink drawings that were politically charged in a stunning way. Leon covered issues of racism, of workers’ rights, of poverty, of hopelessness. He dealt with the ruling class and its grip on power, the effects of the Spanish Civil War, the absurdity of war more generally. The images pulled no punches. The series was powerful in every respect; it didn’t retreat to the edges of these major themes…he dove into them with intensity and dedication. He wanted to make a point. The country was in very deep trouble. Through his art, Leon tried to identify the elements of the issues that had been gripping the nation since the Great Depression took root. Three of the drawings in that series are in our current Autumn into Winter exhibition 2018-2019. In the Shadow of Liberty takes our great national symbol and decries the injustices that lurk all around it: lynching, unemployed workers, police brutality against protesters. How can we extol this symbol of liberty and freedom while such injustices exist? I specifically chose Mass/Mass in these troubled times in which we are living. This drawing was based on Father Coughlin, a racist, fascist, anti-Semitic priest who had a huge radio audience, to whom he spouted the worst demagoguery imaginable. The current MAGA rallies we have witnessed in the current pitiful excuse for a presidential administration recall those terrible days of the rogue priest. This image, showing Coughlin holding such sway over his followers, has reared its ugly head in our time, in a way that we could never have imagined. 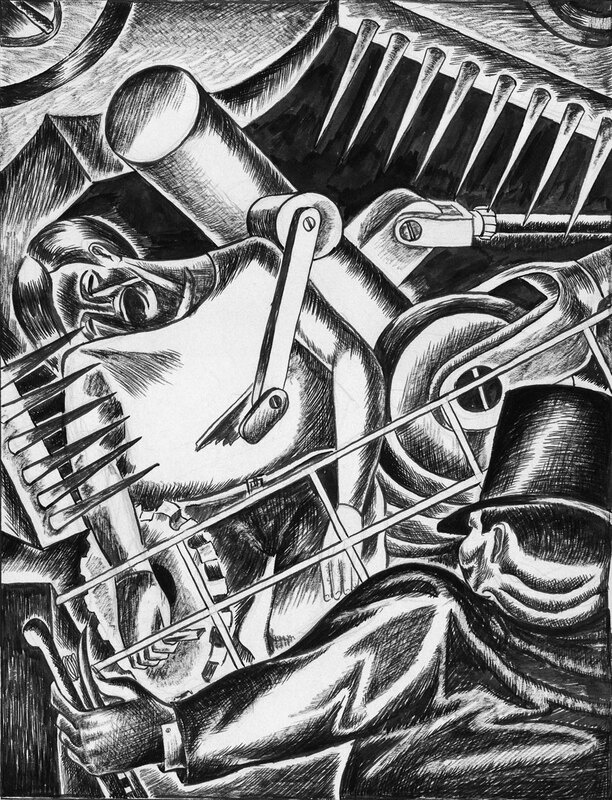 Machinery Devours portrays a worker enmeshed and crushed by a machine, while The Man looks on, brutally holding the lever of power.